A frequent theme in the literature on historically Black colleges and universities (HBCUs) is their supportive and nurturing environment. Despite the consistency of this theme, less research has provided context about some of the contemporary experiences of Black men at HBCUs. This information is critical because many Black colleges, much like their predominantly White institutional counterparts, have high Black male attrition rates. 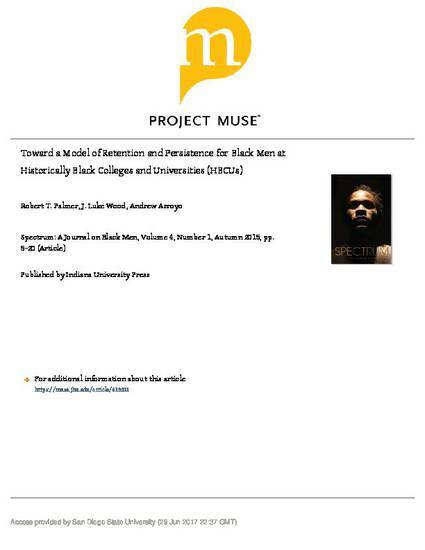 This article seeks to help Black colleges reduce attrition among Black males by using empirical literature specifically focused on Black men at HBCUs to inform a model of retention and persistence for this student demographic. In addition to fully contextualizing the model, this article concludes by discussing implications for future research on Black men at HBCUs.